We started a garden. It’s weird that I am so happy about it because I am not really a gardening type. I have never been particularly interested in plants or horticulture. But I had a few freelance assignments last year about local food and farmers in San Diego. I was so inspired by those men and women, by their fierce tenacity and determination. Their desire to feed people real food and their refusal to submit to fast, easy solutions. Farmers, I am convinced, are a grounding force in our chaotic world. I didn’t really put all that much effort into this garden. It was just an intention, a hope. There is a patch of mostly bare soil outside a basement window in the back of our house. It doesn’t get much sun in the summer and we didn’t do anything to prep the soil. But two weeks ago, I showed Scott the spot I wanted to dig up. The next day, he was out there with the boys shoveling. Gus was busy pouring dirt into a bucket and Oliver loved using his new wheelbarrow and rake to dump weeds over the steep edge of our yard. 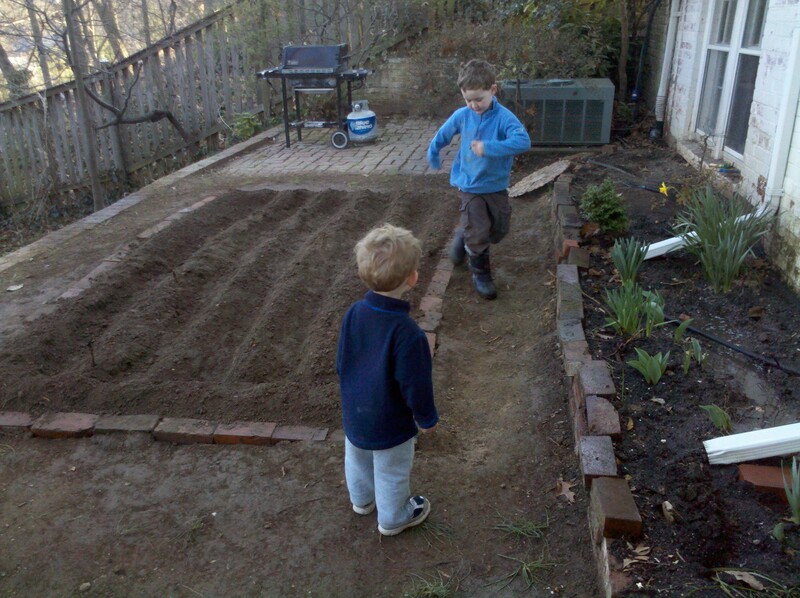 “Mommy,” he said, “I think I am going to have my own gardening company someday because I am so good with these tools.” At one point, we were all out there digging. This was new for me, this family time. Isn’t that awful? But for the last year, Scott and I have been tag-team parents on the weekends. He goes mountain biking and when he comes home, I go for a run. I go to yoga and when I come home, I’ll get Gus down for a nap. Occasionally we’ll go out to dinner or go for a walk, but not often enough. Scott surprised me again last weekend. Last Friday after the rain, I went out with the boys for a few hours to dig up the soft ground. I thought we did a great job and even Scott was impressed. “But look at all those old tree roots,” I told Scott. He shrugged off the roots. “It should be OK,” he said. The next day, when I came home from yoga, my small efforts were totally blown away by Scott and the boys. He dug way deeper than I could have and he and Oliver and Gus got rid of every single root. “I thought that they might take too much water away from your plants,” Scott told me. I looked out into the now gorgeous patch of earth. The next day, Scott lined the garden with bricks. He made furrows in the ground and we all made tiny holes in the surface. We brought out those awesome packs of seeds as if it were Christmas. We ripped them open after showing each other the cheesy photos on the front: lettuce and spinach, peas and nasturtium. “Can I put the seeds in?” Oliver asked while Gus threw things over the edge of our backyard. “What does that seed look like?” he asked and I handed him tiny grains of lettuce, big round peas that will hopefully become sweet, flowering plants. I read Margaret Roach’s incredible gardening blog everyday now. My mom just bought me a subscription to an organic gardening magazine. On Saturday, after hearing the full magnitude of the earthquake in Japan, I silently dedicated our little piece of land to that beautiful country. I feel now much as I did after September 11th. I was in San Diego then and felt so horribly helpless. My brother had moved to New York, to his girlfriend’s apartment on John Street on September 10th. For most of the next day, I couldn’t get in touch with him. He was supposed to start his new job at Bank of America and I had no idea whether his office was in midtown or downtown. I didn’t know he was on a ferry to Hoboken, that he was watching the horror as it happened. A few weeks ago, we met Scott for lunch at the Pentagon. What impressed me most were not the three intense security checks before we even got to the building, but the huge quilt hung by the entrance, each square representing a person killed there on September 11th. Tears welled up as soon as I saw it. My god, that terrible day. We ate lunch with Scott at one of the Pentagon’s many food courts and then walked through the building, over the big green lawn at the center of the Pentagon, passed the restaurant smack dab in the center of that lawn like a bull’s eye. You never know. You just never know when disaster will strike. That fall, in 2001, I was depressed. I felt hopeless and heartsick. The innocence of our country had been shredded. I cut Billy Collins’ poem “The Names” from the New York Times and almost memorized it. Let X stand, if it can, for the ones unfound …. And yet it does no good to be powerless, to be depressed. I think about the parts of my day that are hard. The hours between 3 and 6 pm. The clean-up after dinner. The bickering. The laundry. I think about a natural disaster destroying all the parts of the day I don’t like and my heart hurts thinking about how much I would mourn the loss of them. I would miss the fighting, the boredom that sets in at 4:13 pm. I would crave a kitchen to clean, clean shirts to fold. I have no emotional response to photos of the devastation in Japan because it doesn’t seem real to me. But the faces – those faces! The loss. 10,000. It almost doesn’t register. Today I am grateful for the hard parts of my day. I am so grateful to the garden, which might be one of the most romantic gifts my husband has ever given me. I didn’t ask for it and he made it beautiful. He dug much further down than I could. He lined it with brick. He told me we can build a fence to keep out the squirrels and chipmunks and the fox that lives in our neighborhood. His face lit up as he dug a 2 inch hole with a stick and dropped in spinach seeds. We are waiting now to see what is going to come up. We are watering and trying to be patient. We know that it might be a bust this year, that bugs and blight and that fox might steal our small harvest away. But no matter what we pull up, we will have enough. We already have abundance. Oh, how wonderful, Pamela. The garden, all three of the men in your life and your words. And that poem…. I know someone who lives near you who is pretty good at the gardening gig! Beautiful. May your garden – and all those affected by devastation – thrive. Out of such mystery we arise, and then return. We bury dead, or scatter ash; we plant seeds and behold growth. We name things, and yet we make nothing; we understand nothing… but we love. We can love. I wish you well with your garden. Spoken like a true Farmer. Only a farmer can look at a patch of fresh tilled dirt and see it as being gorgeous. Sounds like you will have a fabulous garden! I need to get out to our garden patch (2, square foot gardens) and get something planted before our baby arrives. You are currently reading Digging at Walking on My Hands.